Student assessment reflects learning outcomes and academic standards. Assessment regulations are applied consistently and fairly. 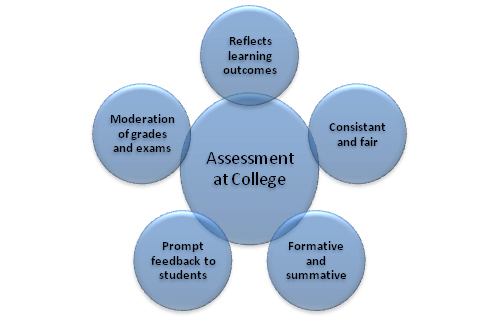 A variety of assessment methods are employed and cover both formative and summative assessment. Appropriate and prompt feedback is provided to students on their assessment results. Moderation of assessment, exams, and grading to ensure consistency and fairness. In order to satisfy the objectives of the assessment strategy, below are the guidelines. Assessment items including exams, assignments, homework, projects, etc. should assess the extent to which the students are meeting the Course Intended Learning Outcomes that have been published. As the CILO are mapped to the Program Intended Learning Outcomes, the assessment in turn contributes to satisfying the PILO. Instructors must ensure balanced and comprehensive assessment of CILO during the semester. The assessment methods should be suitable to the level of the assessed learning outcomes. Each question in the test/exam should be marked by the same instructor across all sections. The same grading range (grade distribution) should be applied to all sections. Common marks distributions shown in the key solutions for tests/exams should be used across all sections. Common exams should be reviewed by all instructors and moderated before the exam by the course coordinator. Students must be allowed access to the assessment results (excluding final exam) and have the right to enquire about the marking scheme and how it was applied. Students have the right to appeal their assessment and ask for a re-grading and verification of the grade. In the case of the final course grade the University process is implemented. In case of protest of other assessment during the semester, the faculty member will verify his grading and explain to the student how the grade was awarded. Students who are not satisfied can raise the issue to the course coordinator and then to the chair of the department. Students have the right to access their course assessment summary (detailed grades in course assessment tasks and midterms) before the end of the semester. A University Council decision requires all instructors to post the detailed “sessional” marks before the last day of classes. Students should have access from the start of the course (typically in the course plan/syllabus) to the schedule of assessment, the types of assessment, weight from total marks and criteria for marking and grading. Course coordinators should ensure that all course instructors and lab assistants also have access to the assessment schedule and weights. Instructors must submit a detailed record form which includes student grades, weights, and maximum grade for each assessment activity to the course coordinator who will submit the report to the chairperson at the end of the semester. The method used for calculating the total grade should also be indicated on this record. Results of the final assessment of the course and the letter grades should be submitted to the Deanship of Admission and Registration after they have been checked and approved by at least two members of the Grade Distribution Committee GDC and the Chairperson. Any suggested grade distribution changes must be submitted to the course instructor/coordinator on the same day the draft grades are submitted to the GDC or the chairperson. Complete records of the assessments should be kept in the department. This is both for student appeal and for accreditation/review purposes. The final exam student papers should also be submitted for storage and appeal purposes. These are usually stored for two years before being disposed of. Instructors are encouraged to use a variety of assessment methods. These may be diagnostic, formative and summative. A policy of using formative assessments should be specified and attached to this strategy. Assessment can include a mixture of techniques including midterm exams, projects, term papers, case studies, quizzes, etc. University and College council regulations specify the weight of final exams at 40%. Other tasks should share the other 60% of the final grade. Exams and tests should also include a variety of question types including essay, short-answer, multiple choices, and other types of questions. The multiple choice questions should not exceed the 20% of the overall marks in any test. Formative assessment should be employed to inform the students of their progress in learning and means of improving it. In order to achieve this, formative assessment should be the basis for prompt and objective feedback to the students. Feedback to the student should be prompt, fair, objective. The feedback might be given to students verbally or in a written form but a record of verbal feedback should be kept. Assessment results should be returned to students within 2 weeks from the date of the assessment activity. For projects work could be done in phases for prompt feedback throughout each phase of the project. A Grade Distribution Committee (consisting of 3-5 members) will be created by each department to ensure moderation and consistency of grading among all courses offered by the department. The GDC will ensure application of the University policies in grading. In the event when the student population is large enough a normal curve distribution can be used, taking into consideration the University normal curve as basis for the grade distribution. Change of curve points is possible due to class level, student population, or other considerations. However, in this case the instructor/coordinator must obtain the consent of the GDC. It is highly recommended that external examiners should be involved especially in the assessment project work and summer training. Internal/departmental exam moderation and grade distribution committee for the moderation of midterm tests and final exams should be created annually.